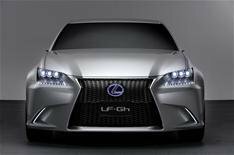 Revealed: all-new Lexus GS concept | What Car? Lexus will pave the way for this year's all-new GS executive contender with this hybrid concept car at the New York Motor Show next week. Called the LF-Gh, the newcomer is slightly larger than the current GS in every dimension. Beyond the fact that it's a petrol-electric hybrid, there are no details on the powertrain of the concept. The production GS due this autumn is likely to be available as a hybrid only, and should follow the look of the concept closely. Lexus says many of the design treatments on the car, including the 'spindle' front grille, showcase future design direction for forthcoming models.